I’m just back from a ten-day holiday in northern Italy, mostly around Lake Garda. While away, I found myself peering at every flower that we passed, looking at the local bee populations undertaking their daily work. It’s curious how one’s outlook changes, based one’s interests! The many lavender plants around the various towns that we visited, proved to be great gathering spots for the local bumbles and honey bees alike, as did the many wild flowers we saw around the lake. Colony 1: Now progressing nicely with both eggs and brood. I might even get a super of honey, if I’m lucky, before our main flow ends [usually at the end of July], although I haven’t added one yet. These ladies are currently in a wooden national hive (brood box only), although I may well transfer them into a poly langstroth, if they look like needing that super. Colony 2: This national hive is currently my strongest box of bees. They are currently working on their second super of the summer, and are mighty busy. I’m leaving them well enough alone, other than checking the supers on a weekly basis. Colony 3: Now combined with ‘old’ colony 4, the numbers in this colony are on the up. 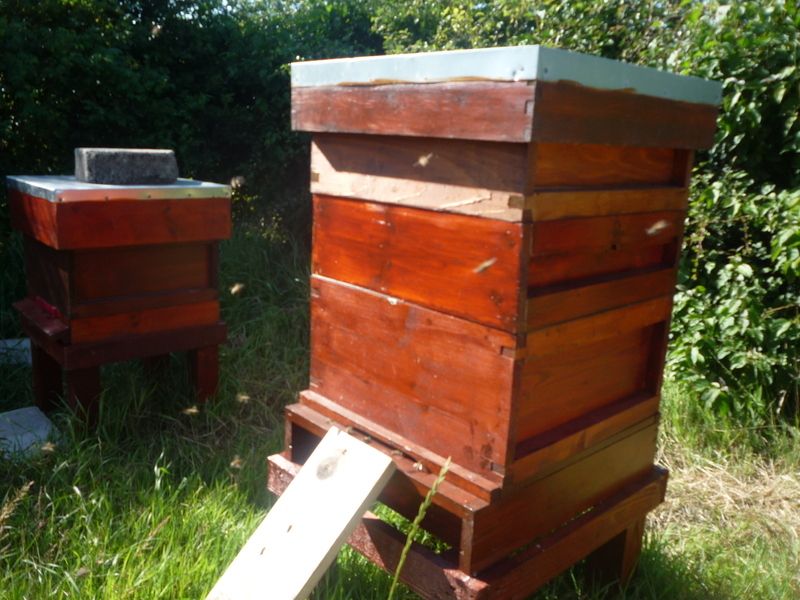 The queen is laying on four frames, currently, so fingers crossed that they’ll be strong enough to overwinter well. The bees are currently across 5 frames of a 10-frame langstroth deep. Colony 4 (was colony 5): These girls, originally from a small caste, are currently in a 5 frame national nuc. On return from Italy I found a hatched queen cell, together with another queen cell that had been ‘chewed out’, on the frame [of then eggs & brood] that I had added on 24th June. As such, I have hopes that a single virgin queen is now around, although I didn’t actually lay eyes on her. So, currently, there is still some hope that this small colony might survive, although with new bees likely to be at least a month away, assuming the virgin queen gets mated and starts laying soon, it’ll be touch and go, numbers-wise, as to whether they’ll be strong enough going into the winter.